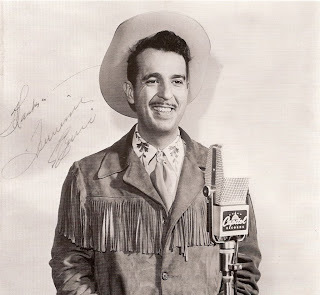 On this day 13th February in 1919 Ernest Jennings Ford, better known as Tennessee Ernie Ford was born. Shotgun Boogie reached US Country No 1 and US Chart No 14 in early 1951. Its a great piece of Western Bop. "He released almost 50 country singles through the early 1950s, several of which made the charts. Many of his early records, including "The Shotgun Boogie", "Blackberry Boogie," and so on were exciting, driving boogie-woogie records featuring accompaniment by the Hometown Jamboree band which included Jimmy Bryant on lead guitar and pioneer pedal steel guitarist Speedy West"